This past week we have seen a number of developments that may spell the end for the marine mammal park “entertainment” industry as we now know it. SeaWorld, Orlando finds itself under fire from Federal Agencies, former employees and witnesses following the February attack and death of orca trainer Dawn Brancheau. Tilikum, a 13,000 pound orca (killer whale) who has been the main attraction of the theme park’s “Shamu” shows was implicated in the deaths of two other people prior to pulling Dawn Brancheau into her watery grave. The horrifying attack which included dismemberment and scalping of the defenseless trainer was witnessed by unsuspecting park-goers and SeaWorld staff as she struggled to free herself from his powerful jaws. As the details of that fateful day emerge, the public is taking notice and SeaWorld may not escape this latest tragedy without undergoing a transformation leading to the abolishment of orca/trainer interactions which may in turn bring an end to the captivity and confinement of this amazing species. The fallout began on Monday, August 23 as the Occupational Safety and Health Administration (OSHA) issued citations to SeaWorld for apparently placing profit above employee safety. These citations opened the floodgates for further legal action by Dawn’s family, terminated employees and witnesses. It has also sparked a growing number of former SeaWorld employees to speak out about the culture of working with Orcas and the secrecy that shrouds the marine mammal entertainment industry. Linda Simons is now speaking out on what she calls questionable or even dangerous safety practices at the Florida park that could result in another tragedy. Simons’ lawyer, Maurice Arcadier, said she was prevented from giving all of the documentation she wanted to OSHA for their investigation. He suggested an impartial panel be appointed to investigate separately. Simons told the Daily News she was fired for talking too much with the federal investigators who were probing the February drowning of trainer Dawn Brancheau by the killer whale Tilikum. Simons, who started work at SeaWorld in Orlando one week before the drowning, has filed a federal whistleblower complaint. Dan O’Connor, a partner with O’Connor & Nakos, declined to discuss whether his firm will bring a suit against SeaWorld. The law firm says on its website that it represents “injured persons and their families in matters of wrongful death and severe personal injury” and lists scores of multimillion-dollar verdicts and settlements won on behalf of injured workers and other accident victims. 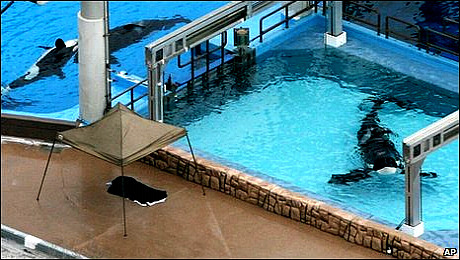 The violations included one that OSHA deemed “willful” — its most severe category, reserved for businesses that OSHA says demonstrate “plain indifference to or intentional disregard for” worker safety — because the agency said SeaWorld routinely exposed its trainers to the threat of attacks from killer whales without adequate safeguards in place. OSHA proposed $75,000 in fines. O’Connor said Scott Brancheau’s lawyers are analyzing OSHA’s materials. Todd and Suzanne Connell, who took their son Bobby to Florida in February to celebrate his 10th birthday, say the boy looked straight into Dawn Brancheau‘s eyes as the doomed trainer briefly freed herself from the orca’s jaws. The boy, who became hysterical as Brancheau’s broken body was dragged around the tank, has been plagued by gruesome nightmares ever since, the family says. The media spotlight continues to shine and expose these revelations as additional witnesses, former employees, Marine Mammal Professionals and Animal Rights Organizations speak out. The facts, as they are revealed, will continue to shed light on what goes on behind the scenes and what future actions and/or inaction may mean for the safety of trainers and the captivity of orcas. It is Orca Aware’s view that these developments WILL lead to major changes in the captive orca programs and eventually phase out that portion of the marine mammal entertainment business. Is this the beginning of the end for the Killer Whale Shows? Tell us what you think. SeaWorld’s ex-safety chief Linda Simons claims gross negligence led to the horrific drowning of orca trainer Dawn Brancheau by killer whale Tilikum in February. Amidst the probe into the attack, Ms Simons claims she was fired for cooperating with federal OSHA investigators, a claim that could bring obstruction charges against SeaWorld. In response, SeaWorld called Ms. Simons an extortionist, saying she threatened to go public with “false allegations” unless she got paid. Simons has filed a federal whistleblower complaint. When the 6-ton killer whale pulled Brancheau under by her ponytail on Feb. 24, the response was “very chaotic,” she said. As tourists watched in horror, Tilikum dragged Brancheau around the tank, scalping her and breaking her neck as well as drowning her. It took 30 minutes to retrieve her body. Simons claims SeaWorld withheld documents from Occupational Safety and Health Administration investigators and blocked interviews with trainers that might have been critical. Brancheau, 40, broke park rules by lying on a submerged ledge in the tank with Tilikum, who had previously killed two other people by pulling them under water. 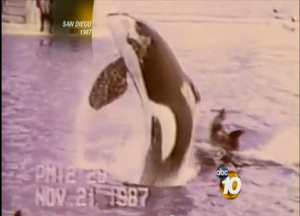 Simons said the whale was considered so dangerous that new workers were routinely warned that anyone who entered his pool would “come out a corpse.” But Brancheau regularly was allowed to play with the orca as if he were “her puppy dog,” Simons said. The OSHA report is being delivered to SeaWorld today. SeaWorld has repeatedly claimed it has fully cooperated with investigators. Simons is flatly contradicting that. Watch her appearance on Good Morning America this morning and let us know what you think. There has been a lot of chatter and rumor that SeaWorld is working on personal SCUBA air systems for its trainers, and is hoping that OSHA–if SeaWorld adopts this technology–will allow trainers to continue to work in the water with killer whales. John Jett, a former orca trainer at SeaWorld Orlando, weighs in on the proposed technology, arguing that it will not really do much to improve a trainer’s chances if a killer whale goes after a trainer, as Tilikum did with Dawn Brancheau. The scuba bottle solution Sea Word is likely to propose to OSHA represents, in practical terms, nothing. In other words, this is a false solution. First of all, there are issues with mouthpieces and hoses dangling off of trainers as these will be something for the whales to become focused on and to grab. After all, Sea World is claiming that Tilikum initially grabbed Dawn’s ponytail, which ultimately lead to her death. I’m not sure how an air hose and a ponytail differ, at least from the perspective of Sea World’s story regarding her death. Do whales differentiate ponytails from air hoses? Secondly, let’s assume a trainer who was being thrashed by a whale was somehow able to get the mouthpiece into his/her mouth and begin breathing from the tank (an assumption I think is faulty as it would be difficult to get a mouthpiece in place while being tossed around). The bottom of the front pool represents about two atmospheres of pressure. The volume of a lung full of air taken at this depth doubles while one ascends to the surface. In the event a trainer takes a breath at the bottom (off of a tank) and is then rushed to the surface by the whale then his/her lungs expand beyond capacity and are ruptured. Whales move quickly. This scenario is a real possibility. Thirdly, and perhaps most importantly, this approach would not have saved Keltie Byrne, Alexis Martinex, Steve Aibel or Ken Peters. Additionally, this approach would have in no way saved Dawn Brancheau from her horrific death. What Sea World is doing is trying to create the illusion that they have fixed a problem which they have no real control over. That is, whales do what they want sometimes, without human consent, and in ways immune to man-made interventions. OSHA shouldn’t buy it. UPDATE: Some other former SeaWorld trainers are weighing in on this issue. I think spare air or any kind of SCUBA gear that a trainer has to be wearing would likely CAUSE more problems than it prevents. It gives the whales something else to grab on to. As JJ said, what’s the difference between a dangling ponytail and an air hose? One of the problems all marine parks deal with is how to keep things out of the mouths of the dolphins and whales. I know of at least one dolphin at SW that died from ingesting coins (zinc poisoning) that were thrown into its pool by tourists who didn’t know better (or who didn’t read the signs that specifically state not to throw things in the pool). And let’s just say a trainer is wearing SCUBA gear, the whale grabs the gear, the trainer gets away, and the whale swallows some of the gear. So, the trainer is OK, but now the whale is in jeopardy. So, even if the SCUBA gear or spare air provides some kind of safety for the trainer (which I don’t think it does), it puts the whales at higher risk of injury and death. I’m absolutely in agreement with JJ’s comments about spare air and lack of benefit to any trainer who ends up in a situation with any killer whale who is no longer under control, as per the videos we can see of prior incidents. I’m sure SW will assert that they can desensitize the whales to the spare air that trainers would be required to wear. This is as meaningless as their previous attempts to assure us that “call backs” will be trained and ingrained so that the killer whales will come back to stage/control despite what is happening in a pool. As we can see with all of these incidents, the call backs are not succesful during real life (life-death) events, when they count, despite their ‘success’ in training sessions. I believe the spare air solution will do nothing other than give the whales another means of potentially harming trainers, either by easy access to pull/drag or, as JJ says, by forcing the trainers to take in air which could eventually lead to bigger problems as per any SCUBA diver who is rushed to the surface. Spare air? Spare me. This is NOT a solution, and would not have prevented Dawn’s recent death or the majority of injuries that have occured as a result of the recent incidents we are aware of. Here’s a video report on Dawn Brancheau’s death that goes back and looks at previous incidents with trainers. Watch John Sillick get crushed at about 2:35 and see if you think “spare air” would have helped him much. U.S. Rep. Alan Grayson, a vocal supporter of SeaWorld Parks & Entertainment, acknowledged Thursday that he intervened in a federal investigation into the death of a SeaWorld killer-whale trainer. Grayson, D-Orlando, personally contacted the U.S. Occupational Safety and Health Administration earlier this week to discuss the agency’s probe of the death of Dawn Brancheau, a SeaWorld Orlando trainer who was drowned Feb. 24 by a six-ton killer whale named Tilikum. OSHA is in the process of finalizing that investigation. The agency must issue any citations, proposed fines or recommended remedies by early next week. Personal note to Rep. Grayson: I appreciate you standing up for all of us so many times and speaking truth to power, and I wish you a long and glorious legislative career, but you have seriously soiled your reputation by trashing OSHA at a time when it is trying to perform its legislative mandate, an all too rare example of an agency doing its job with high integrity in the face of a corporate bully. You have lined up alongside the bully this time, and that won’t be forgotten. It is not the first time Grayson has come to SeaWorld’s defense. When the U.S. House of Representatives organized a hearing in April to examine marine parks and aquariums — a hearing prompted in part by the Brancheau tragedy — Grayson made a special appearance to speak on SeaWorld’s behalf. As Air America’s Stephanie Miller gushes, “I love him, love him, love him,” but it turns out Grayson has sided with SeaWorld’s lobby effort to derail an OSHA report. Yes, those minimum wage jobs are valuable, and yes, we want Grayson to be re-elected many times over, but this blatant, corrupt interference in due process is an assault on democratic values. Grayson is acting as a perfect example of the corporate stranglehold on the legislative process that he otherwise so effectively battles. Some background: In 2006, at SeaWorld in San Diego, a trainer was dragged by his foot several times to the bottom of the 30′ deep tank and nearly drowned. OSHA’s report on that incident noted that such attacks on trainers were inevitable and that trainers were in danger whenever they swam with the whales. SAN DIEGO — SeaWorld officials Thursday hotly disputed a finding by state investigators that it is “only a matter of time” before a trainer is killed by one of the park’s killer whales. “The trainers recognize this risk and train not for ‘if’ an attack will happen but ‘when,’ ” said a report by the state Division of Occupational Safety and Health. The report, released Tuesday, follows an investigation into a Nov. 29 incident in which Kasatka, a 7,000-pound, 17-foot-long female, dragged her trainer underwater in front of hundreds of horrified spectators at Shamu Stadium. SeaWorld officials branded the report’s findings “highly speculative and not supported by scientific fact” and met Thursday with the Cal/OSHA district manager to ask him to withdraw or modify the report. Although the SeaWorld trainers are experienced and well schooled in animal behavior, the risk of swimming with the behemoth mammals cannot be eliminated, the report said. Within 24 hours SeaWorld had bullied OSHA into retracting its report and issuing a bland whitewash with no such warnings or recommendations. 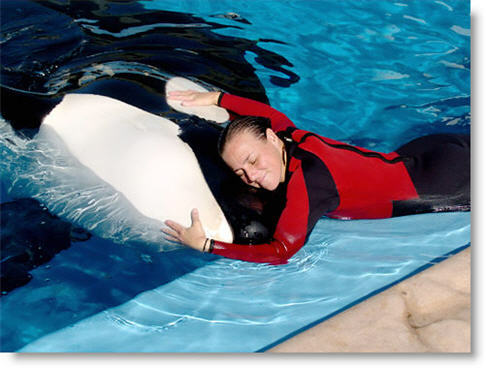 Then on February 24, 2010 trainer Dawn Brancheau was killed by a 12,000 pound male orca named Tilikum at SeaWorld in Orlando, commencing an investigation by OSHA that is, or was, due to be released this week. But in true form and totally in keeping with its modus operandi, SeaWorld has enlisted Rep. Alan Grayson to lie to the American public and bully OSHA to once again whitewash their report. But SeaWorld has done what it could to make that work as safe as possible,” Grayson said in the statement. They have not. 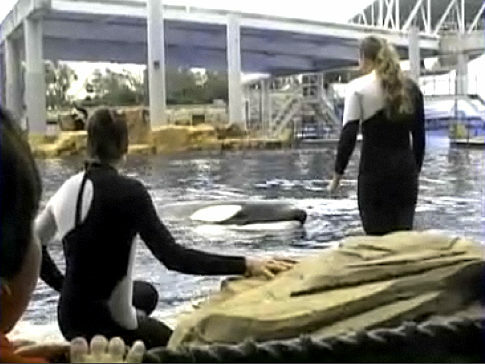 Because they got away with it the last time OSHA tried to warn them, they were lax about policies that encouraged Dawn Brancheau to lie down on a submerged ledge in front of Tilikum, from which he grasped her by the arm and dragged her to her death. The story SeaWorld is selling, that he grabbed her by her ponytail, is at odds with the taped evidence that he deliberately grabbed and dragged her by the arm. It’s not just Tilikum endangering trainers at marine parks. See Violent incidents between humans and killer whales in captivity – a longer list than the parks would like to tell you! for a partial list. True that SeaWorld offers thousands of low-wage jobs – even the glamorous trainers are poorly paid – but the amusement park is notorious for distorting and fabricating its version of orca natural history, like stating that the natural lifespan of orcas is only 25-35 years, to better justify the short lifespans of captive orcas. 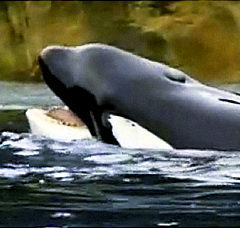 (Life spans for free-ranging orcas is 50-100 years for females and 30-60 years for males) They also demonize the natural marine environment to justify their keeping the most social mammal known to science as commodities in an entertainment industry, where they are shipped around from park to park to suit management needs. There’s one other great post on Daily Kos about this. We highly recommend you read it as well. There is lot’s more in the pipeline, so check back or subscribe via RSS.